"It's not very often that the president takes your city's name in vain"
President Donald Trump and a Massachusetts mayor are in a war-of-words after Trump blamed the city of Lawrence as a significant source of the drugs pouring into New Hampshire during a speech on his new opioid plan. 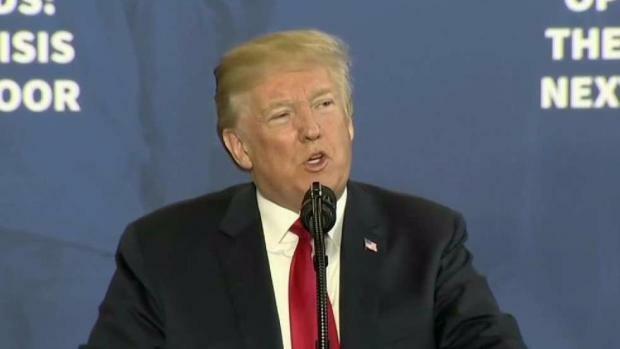 President Donald Trump singled out the city of Lawrence, Massachusetts, as a significant source of the drugs pouring into New Hampshire during a speech on his new opioid plan Monday. 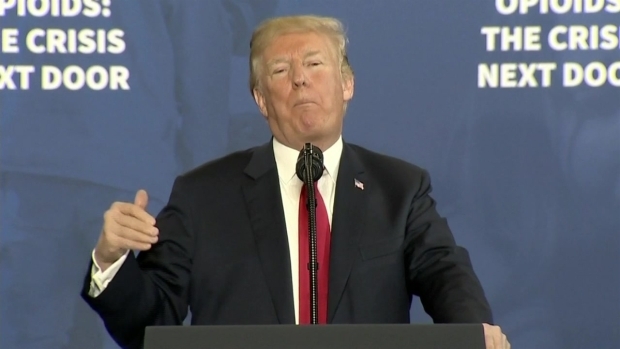 Speaking at Manchester Community College, Trump said Lawrence is "one of the primary sources of fentanyl in six New Hampshire counties," according to a Dartmouth College study. He tied this to the fact that Lawrence is a so-called sanctuary city, and also cited the recent arrest of 15 MS-13 gang members in Boston. "Every day, sanctuary cities release illegal immigrants, drug dealers, traffickers, gang members, into our cities," Trump said. "They're protected by these cities, and you say, 'What are they doing?' They're safe havens for just some terrible people, and they're making it very dangerous for our law enforcement officers. "You see it all the time," he continued. "As the people of New Hampshire have learned firsthand, ending sanctuary cities is crucial to stopping the drug addiction crisis." Mayor Dan Rivera of Lawrence, Massachusetts, is speaking out against Donald Trump after the president blamed his city for the opioid problem in New Hampshire. Lawrence Mayor Dan Rivera fired back at Trump later Monday afternoon. "I've got a lot of emotions running through me right now, because it's not very often that the president takes your city's name in vain. So I'd like to start by saying shame on the president'" Rivera said. "He's trafficking in pain and divisiveness, creating boogiemen where we need solutions." Furthermore, Rivera argued, Trump's proposed solution is one that has failed in the past. "I'm a Reagan baby, I'm a kid from the 80s. I remember the crack epidemic. I remember the 'Just Say No' to drugs campaigns. I remember the increased prison time for dealers and users," he said. "But you know what beat the crack epidemic and the cocaine epidemic? It was police practicing community policing, jobs for inner-city kids and treatment, treatment, treatment. Serious, long-term, expensive treatment." U.S. Rep. Bill Keating, a Democrat from Massachusetts and a member of the bipartisan Heroin Task Force, agreed that the epidemic should not be combated as a crime. "Over a decade and a half ago, as Norfolk County district attorney, I started an opioid task force, and what I learned from my experience is that the president has it all wrong," Keating said in a statement. "Back then, I was tasked with the responsibility of approaching it from a criminal side, but I learned this is much more a public health issue. That is why the Centers for Disease Control advocates for an approach of combining medically assisted and behavioral health treatment as the best course." "Massachusetts has been a leader in treatment and prevention natinwide," Keating added. "While interdiction and law enforcement have a place, the narrow approach that dominated the president's remarks today simply won't work. President Trump is taking us backwards." Rivera pointed to Trump's earlier criticisms of the Granite State and accused him of politicizing a deadly crisis. "Talking out of both sides of his mouth today, he went to New Hampshire, smiling in New Hampshire's face, after calling them a 'drug-infested den.' This is not a political problem, this is not a crime problem, this is not an immigration problem. This is a human problem," Rivera said. "This is an American problem, with more than 175 Americans dying every day. And the president continues to treat every problem that faces our country like a campaign rally, and it's not." New Hampshire Gov. Chris Sununu, a Republican whom Trump praised in his speech Monday, offered similar criticism of Lawrence a year ago, accusing the city of fueling the Granite State's drug crisis. Sununu labeled Lawrence as the prime source of fentanyl coming into his state and warned that he was about to "get tough" on dealers across the state border. Rivera hit back at the time, accusing Sununu of "threatening the sovereignty" of Massachusetts and failing to build enough treatment beds in New Hampshire. 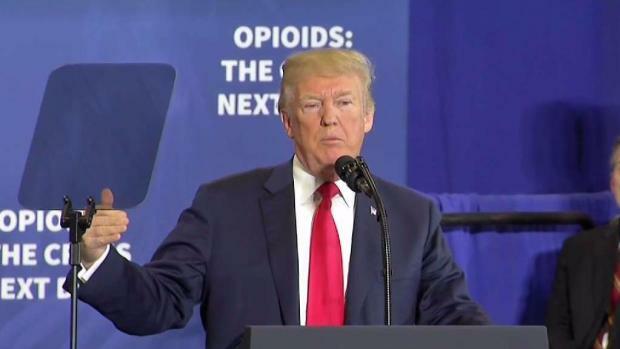 President Trump slammed Lawrence, Massachusetts, as the source of New Hampshire's opioid problem. "The opioid crisis is so large that no community is without a problem, and to make it about Lawrence is the trap," Rivera said. Sununu and Rivera later spoke on the phone, after which Sununu said Lawrence has been "doing a good job" on the opioid issue. Sununu wasn't the first New England governor to accuse Lawrence, a city of many immigrants, of fueling the region's drug crisis. Maine Gov. Paul LePage said black and Hispanic drug dealers from Lawrence and Lowell were trafficking drugs into his state. Trump was in New Hampshire on Monday to unveil his plan to combat the country's opioid crisis. His plan calls for stiffer penalties for drug traffickers, including the death penalty where it's appropriate under the current law. Trump's three-part plan includes multiple steps to raise awareness, cut the illicit drug flow and expand proven treatment options.